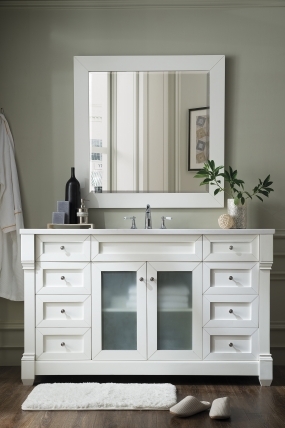 This great single sink vanity base will bring an updated look to the bathroom. 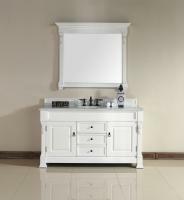 The simple but classic styling will go with many types of décor, the cottage white finish will work with any color scheme. The hardware pulls are made with the very popular brushed nickel finish. The nice size of this piece allows for ample storage space amid the eight drawers and double door cabinet. With all of that room, organizing the space will be a breeze. 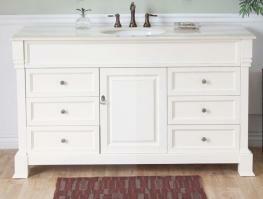 This piece is created with soft close hinges. 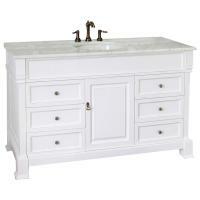 The counter top and sink are both made of materials with a nice white tone.